Currently, as I write this post, it is a gloomy, rainy day here in New England. Although it is the perfect excuse for a lazy and cozy day indoors, I can't help but miss the warmth and sunshine of the southern coast of France. The French Riviera was an absolute dream. It was the perfect mix of seaside charm and that French je ne sais quoi. To say it was beautiful beyond words would be an understatement. The French Riviera, better known as Côte d'Azur, is made up of several seaside resorts including the well known vacation destinations of Nice, Cannes, Saint-Tropez, and Monaco. 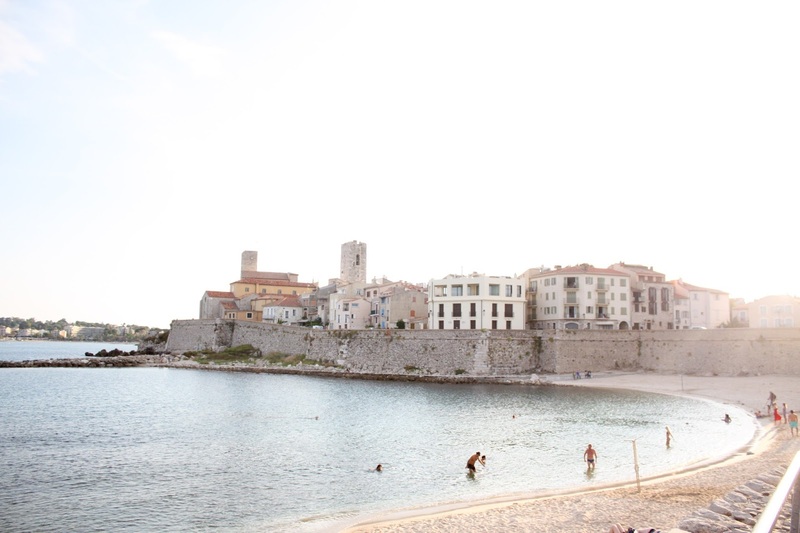 We stayed in Antibes, which is located between Nice and Cannes, and it was the perfect spot to spend a day relaxing. At this point in the trip, we were about three weeks in, and after the hustle and bustle of many cities, the French Riviera was a much needed change of pace! With only one full day in Côte d'Azur, we wanted to take in everything that Antibes had to offer. To start the day we headed into town to check out Le Marché Provençal. It was the biggest (and best) outdoor market that I've ever seen and offered everything from flowers to spices, soaps to fresh produce, and even meats and cheeses. It was amazing. Every morning the Provencal market sets up and is bustling with shoppers picking up fresh local goods - it is a must do if you are ever in Antibes! I picked up some handmade lavender soaps, and the cutest straw market tote (I'm obsessed). A friend and I grabbed some fresh pesto, artichoke, sun-dried tomato, and cheese spreads to bring with us to the beach. Before heading there, we stopped into a local boulangerie to pick up a couple baguettes (the best bread I have ever had..) for the spreads and of course we grabbed a couple bottles of rosé. Safe to say we were ready for the beach! The beach was a short walk from the town center and was situated just perfectly on a small inlet of the Mediterranean. It was the perfect spot to spend the remainder of the day! We soaked up the sunshine, ate our food and drank (many) bottles of wine, and just enjoyed each other's company. Oh, and I can't forget about taking a dip in the Mediterranean! It was some of the cleanest and warmest water I've ever been in - I seriously could have stayed in it all day. A short walk from the beach was a medieval stone wall that created a landing which offered the most beautiful views of the ocean and of the city of Nice in the distance. It was one of those views that took my breath away, left me speechless, and with a tear in my eye because I was so overwhelmed with gratitude and beauty. I now understand what it feels like to be awestruck. It is a feeling I don't think I had ever experienced until my trip to Europe, and one that I was lucky enough to feel multiple times throughout the month. I can never thank the world enough for being as beautiful as it is. 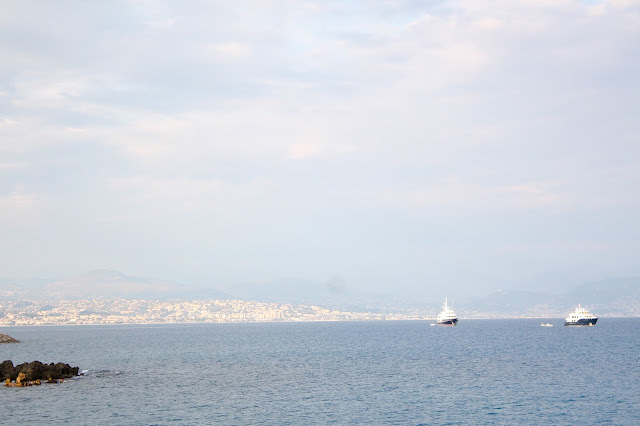 Looking back on my trip, this day spent on the Mediterranean stands out as one of my favorites. To be able to enjoy exploration, sunshine, great food & wine, and the company of new friends in such a beautiful place is something I will forever be grateful for. Only being there for a day was such a tease! 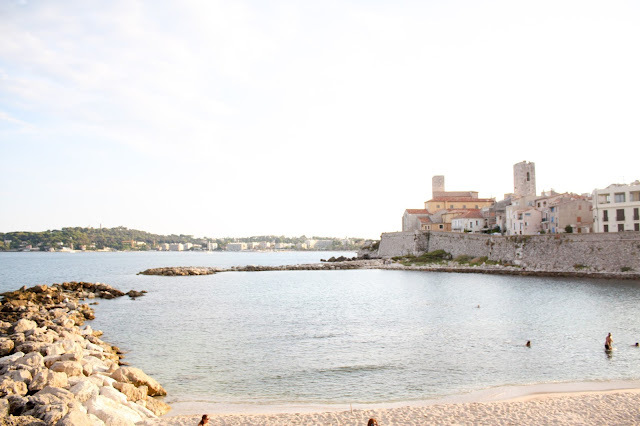 I could have easily spent an entire week exploring the French Riviera, and I am already excited for the day I return. I decided it would be the most perfect honeymoon destination (ha) - hope you don't mind future husband! Thank you Antibes for truly one of the best days ever. It's safe to say this was just the beginning of a long term love affair with the French Riviera. I'll see you again. Until then, stay beautiful!